15336.842 Celestia E. 8 BIGELOW, dau of Thomas Sumner 7 ( Elisha 6 , Paul 5, Cornelius 4, Samuel 3, Samuel 2, John1) and Clarissa (JACOBS) WARNER BIGELOW, was born at Akron, Summit co, OH on 23 March 1835 and married Benson Huntley on 24 September 1854 at Akron. Benson was born in 1832 and died on 01 March 1885 in Mercer county, IL. Celestia died at Port Byron, Rock Island co, IL on 12 September 1912. ( error April 1912). 15336.8422 John Julius HUNTLEY, b 15 Oct 1859; d 27 Aug 1928 Van Nuys, CA; m 27 Nov 1884 Rose Schmidt. 4 children. vital records OH and IL; Bigelow society records. 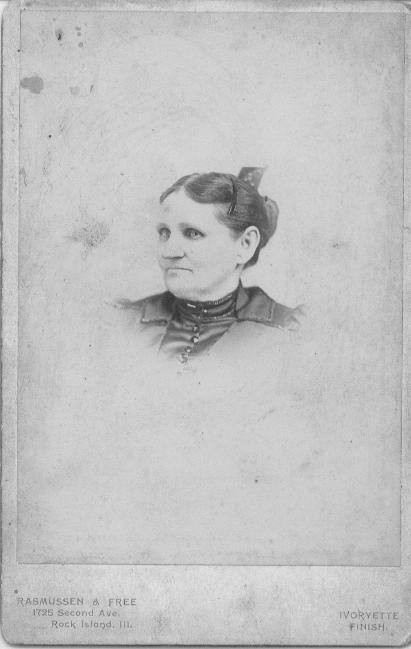 Attached is a picture of Celestia Bigelow Huntley (1835-1912). Also, a transcript of her obituary is provided below. Mrs. Celeste Bigelow Huntley, who had been a resident of Mercer and Rock Island counties since 1853, died Saturday afternoon at 1 o’clock at the home of her son, John B. Huntley, at Port Byron, aged 77 years and six months. Mrs. Huntley was a native of Akron, Ohio. Benson Huntley, the husband, died 27 years ago. Of nine children born of the union seven survive: George W. Huntley, Rock Island; John J. Huntley, Port Byron; L. E. Huntley, Cherokee, Iowa; Charles H. Huntley, Andalusia; William and B.B., Port Byron, and Clara M. Pierce, Mitchellville, Iowa. Mrs. Huntley also is survived by two brothers and a sister. She had been a member of the Christian church since she was 16 years old. Burial will take place in Reynolds. Obituary from: The Moline Evening Mail, Moline, Illinois, Tuesday, September 24, 1912, page 10. Joe Huntley stated: From information I received, there is a discrepancy in one of the children of Benson and Celestia (Bigelow) Huntley's children, his grandfather, Charles Huntley which shows middle initial as E but his real name is Charles Hiram Huntley, interred in Andalusia, IL and his wife's name was Anna I. Britton, which he felt should be Anna. Benson's family lines on his website above. 1. Benson's year of birth calculated from his gravestone. years and 6 months. This would make her year of birth 1835 or 1836? dates of birth, death, marriage and number of children from obituary. 4. John Huntley number of children from family contact. 5. Charles Huntley date of death and day of marriage from obituary. year of birth from obituary and family contact. 6-29-1924 3. Celestia b 12-23-1898 died in infancy July 6, 1899.
of whom is Joe Huntley. looney@flippin.net, and my e-mail came back. Samuel, and Lemuel. I need more info to connect them with Benson.